Swedish vehicle maker Volvo is working on technology that will automatically detect animals on the road and apply the brakes if the driver doesn’t. The next-generation active safety system will comprise two parts – a radar sensor and an infrared camera that can also detect objects when driving in the dark. Volvo safety expert Andreas Eidenhall says the goal is to avoid or mitigate the many serious collisions that occur each year involving animals. 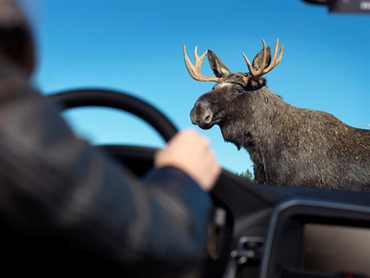 The development team from Volvo has been digitally logging film sequences of larger animals in the first instance, such as horses, red deer, moose, and fallow deer, to enable the system to detect the presence of the animals. Collisions with animals on roadways take a heavy toll. The safety feature is designed to first send a warning to the driver. If the driver does not respond, the system will automatically apply the brakes. An active safety system expert with Volvo, Andreas Eidenhall, says the goal is to avoid or mitigate the many serious collisions that occur each year involving animals. “The technology is based on training the system to recognise the shape and moving patterns of animals and the biggest challenge in this project is gathering enough data to perform this training,” Eidenhall says. A driver’s worst nightmare. Volvo is working on technology to reduce animal collisions. “Right now we are right in the middle of that process. “We started with moose and deer but now we have moved on to horses and cows. We are focusing on the largest animals that cause the most serious collisions. “Animals are designed to be invisible by nature so the system will need more angles and views of them than of pedestrians. “Even though we would ultimately like to avoid collisions with animals, the top priority now is to reduce the speed from around 100kmh down to below 80kmh. Below that speed the passengers in the car are well protected and the risk of serious injuries is much smaller,” he says. The current system has a reaction time of about half a second, but its developers below the next generation will have an even faster response time. Volvo says it is confident that animal detection technology will reduce injuries and fatalities. The system is planned to be in production soon.